As it becomes less common for donors to carry cash around, nonprofits must seek solutions that make giving simple on the go. 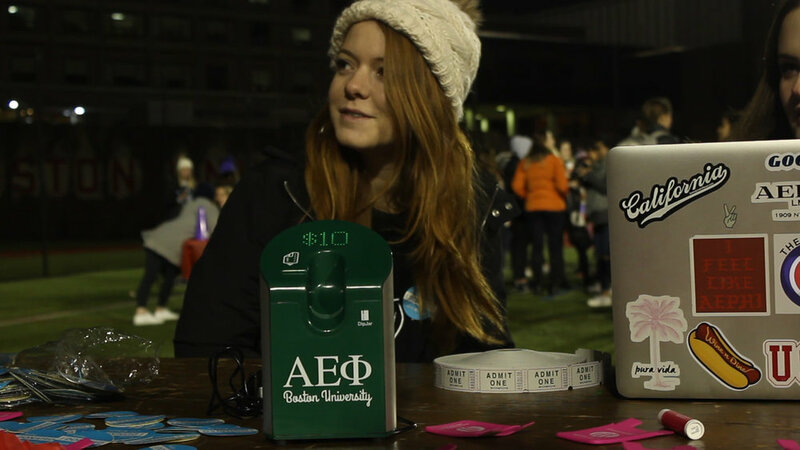 If you've started your search for an easy way to accept credit card donations, you've probably heard of portable card readers (or dongles) like Square for nonprofits, an app and card reader combination that allows nonprofits to accept donations during events. At first glance, Square and these other card readers may seem like the perfect solution, but there are many alternatives that can offer your organization a much better giving experience. Square for nonprofits can't be branded. There are too many steps. The donation process is complicated. You always need someone to help the donor. You have to charge your Square card reader. The giving experience isn't satisfying. Keep reading to learn why Square isn't the best option for your organization's needs and see how DipJar offers a better solution! 1. Square for nonprofits can't be branded. Branding is important, especially if you're looking for a card reader that you can bring to events. Having a consistent brand helps donors know who you are and can leave them with a lasting impression. Unfortunately, this isn't possible with Square. The device only comes in one design and one color: white. Donors don't have the option to customize Square or make it unique to their organization. Look for a device that allows you to customize its appearance so that it fits with the rest of your organization's brand. Look at how SeriousFun branded their giving device. Donors can trust their money is going to the right place allowing you to do more good in the world. Email a high resolution image of your logo to support@dipjar.com to see how it looks before or after ordering. 2. There are too many steps to donate. Donors are looking for convenient ways to give to your cause; too many steps can cause friction and are often too time-consuming. If the process takes too long, some donors might reconsider giving to your organization. Insert the amount they want to give. Sign to confirm their gift. Make your giving process short and sweet, and up your donation amount with DipJar. The fewer steps donors have to take, the more likely they are to give—and give again in the future. Choose a device that requires the least number of steps possible. In this image, see how donors using DipJar only have one step to complete: dipping their card in and waiting for the sound that confirms their donation. When the giving process is fast, donors can give freely, making it easy to use in any situation (i.e. at events, during checkout at retail partners, and onsite). Final Thought: Use a device that reduces the number of steps needed to donate. That way, there are fewer obstacles stopping your supporters from contributing. 3. The donation process is complicated. If you've ever made a purchase (or donation) using a card with a security chip, you know how complicated the process can be. It's often unclear whether to swipe your card or insert it into the chip reader. With Square, donors either swipe the card when there is no chip or "dip" the card when there is a chip. These actions aren't intuitive and require someone to help donors through the steps, which can complicate and add more time to the donation process. Look for a universal way to donate—whether the donor uses a chipped card or not. For example, with DipJar's one-step process, there is no confusion about how to insert your card: you just dip it in and wait for the sound that confirms your gift. Since the same process works for both types of credit cards, the donor doesn't have to complete any complicated maneuvers to use a chipped card. Final Thought: Don't make the giving process confusing, especially if there are ways to simplify it! With a single way to accept all card types, each giving experience is quick and convenient. 4. You always need someone to help the donor. Since Square's giving process is more complicated than other solutions, you'll need to have a staff member or volunteer present to help guide donors through the process. As these members will have to be trained on how to use the device, you'll also have to consider the time to make sure that volunteers and team members are comfortable using Square. Moreover, always needing someone to help donors will limit where you can place your giving kiosk. For instance, let's say your museum wants to place a giving kiosk in the welcome center so that donors can give before or after your tours. It can be a waste of valuable resources if you need to have a staff member standing there all the time. When you have a giving kiosk with a simplified process, there is less of a need to have someone there to walk donors through the steps. With a simple giving kiosk, you can place the device anywhere and feel confident that donors will understand how to give. 5. You have to charge your Square card reader. Have the device charged ahead of time. Attach Square to a smartphone or tablet (that also needs to be charged). As such, the ability to accept donations depends on the battery life of two separate devices. Nonprofits risk losing battery power halfway through their event and their ability to accept card donations, which can decrease the number of contributions they receive. While there are really only a few ways to power card readers, you should choose a device that can be powered by more than one method. That way, you can operate your device for the entire event! First, DipJar plugs in so you have power wherever there's an outlet. Secondly, you can connect DipJar to an external battery. With a device that's versatile, you can accept donations in more situations and won't risk running out of power when you need it most. Final Thought: Don't risk losing the ability to accept donations by having multiple ways to keep your device powered. 6. The giving experience isn't satisfying enough for donors. With Square for nonprofits, donors swipe (or sometimes dip) their cards and complete the necessary steps just like they would for any transaction. Therefore, there is no distinction between giving and buying, and donors are left without a satisfying experience. If donors don't have a unique experience, the act of giving becomes like any other purchase, making it feel more like a chore rather than a joy. Donating should be a unique experience so that it doesn't get confused with buying a product or paying a bill. For instance, when donors place their cards into a DipJar, the lights on the front start to blink and they know their gifts are confirmed after the DipJar makes a pleasant sound. The unique act of dipping your card reminds people that they're supporting a cause and will set your nonprofit apart from other organizations. Plus, the act of donating becomes fun, encouraging more donations in the future. Final Thought: When you create a fun and unique experience, it will not only make your organization more memorable, but your donors will also want to give. Now that we've gone through all 6 reasons, it's clear that Square isn't the best option for your nonprofit's needs. When it comes to choosing a giving kiosk, customization, a simple process, and an enjoyable experience are all crucial elements of a successful device. Maximize Credit Card Donations at Events. Events can be some of the most effective places to collect donations. Learn how you can earn more by accepting credit card donations at your upcoming events. Unlock Your In-Person Fundraising. With in-person fundraising, you have the opportunity to engage with potential donors and cater your pitch to the areas that mean the most to them. Learn 4 tips on how you can utilize in-person fundraising.